14 January 1925: born in Tôkyô. October 1951: premiere at the Meijiza of Mishima Yukio's Buyô dance-drama "Hade Kurabe Chikamatsu Musume", which stars geisha from the Yanagibashi district in Tôkyô. It is part of the 5th Yanagibashi Midorikai dance gala. March 1953: premiere at the Kabukiza of the dance-drama "Kochô", which is based on a novel of Yamada Bimyô dramatized by Funahashi Seiichi. "Kochô" is directed by both Funahashi Seiichi and Mishima Yukio. October 1953: premiere at the Meijiza of Mishima Yukio's Buyô dance-drama "Muromachi Hangonkô", which stars geisha from the Yanagibashi district in Tôkyô. It is part of the 7th Yanagibashi Midorikai dance gala. December 1953: premiere at the Kabukiza of Mishima Yukio's drama "Jigoku Hen", which is based on Akutagawa Ryûnosuke's eponymous short story ("Hell Screen", 1918). November 1954: premiere at the Kabukiza of Mishima Yukio's comical play "Iwashi Uri Koi no Hikiami" [casting]. Premiere at the Haiyûza Theatre in Tôkyô of Mishima Yukio's drama "Musume Gonomi Obitori no Ike", which is based on Santô Kyôden's yomihon "Sakura Hime Zenden Akebono no Zôshi" and stars the Haiyûza non-Kabuki troupe. February 1955: premiere at the Kabukiza of Mishima Yukio's dance-drama "Yuya", which is based on the eponymous Nô drama. November 1955: premiere at the Kabukiza of Mishima Yukio's drama "Fuyô no Tsuyu Ôuchi Jikki", which is based on Euripides's drama "Hippolytus" and Jean Racine's drama "Phèdre". 1957: publication of "Onnagata", a short story depicting the love story between a famous onnagata and a young man of the contemporary theater. The actor in the novel is a fictitious one, the heir of the Sanogawa clan and the holder of the prestigious name of Sanogawa Mangiku (a long-forgotten name, even for the 1950s Kabuki connoisseurs). October 1958: premiere at the Meijiza of Mishima Yukio's Buyô dance-drama "Hashi Zukushi", which stars geisha from the Yanagibashi district in Tôkyô. It is part of the 11th Yanagibashi Midorikai dance gala. November 1958: premiere in Kabuki at the Kabukiza of Mishima Yukio's drama "Musume Gonomi Obitori no Ike". November 1959: revival at the Kabukiza of Tsuruya Nanboku IV's masterpiece "Sakura Hime Azuma Bunshô", which is supervised by Mishima Yukio [casting]. July 1961: Mishima Yukio's Buyô dance-drama "Hashi Zukushi" is staged at the Kabukiza ... with a Shinpa troupe. November 1969: premiere at the National Theatre of Mishima Yukio's drama "Chinsetsu Yumihari Zuki". 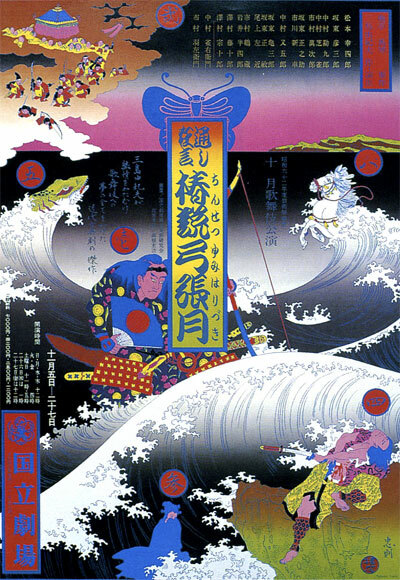 Based on a long yomihon by Kyokutei Bakin, it has exiled warriors, imperial ghosts and plotting in exotic Okinawa. The play is a fusion of all the key themes of Mishima: politics, beauty and cruelty. "Tamasaburô, then just 19 years old, enchanted Mishima with his talent and ethereal beauty in performing the part of Princess Shiranui, Tametomo’s first wife" (Sasaguchi Rei). August 1970: publication of a short essay about the actor Bandô Tamasaburô. "The onnagata is the flower of Kabuki, and although the great elders are essential in this field, if there were none of these flowers in bud, Kabuki would not survive. Nowadays, even though we would like to cultivate such flowers, there is no soil for this purpose and we can only impatiently wait for a miracle. Tamasaburô, who was born to come up to our expectations, is a young onnagata, whose elegance and delicacy call to mind the working of ivory, and is the living proof of the vitality of Kabuki". 25 November 1970: Mishima Yukio dies, committing seppuku after a failed coup d'état. A very unusual way to leave the world in modern Japan! June 1971: premiere in Kabuki at the National Theatre of Mishima Yukio's Buyô "Muromachi Hangonkô" (which was created in 1953). November 1971: Mishima Yukio's drama "Chinsetsu Yumihari Zuki" is adapted to Bunraku at the National Theatre. Mishima Yukio was a prolific writer, who was regarded by many critics as the most important Japanese novelist of the 20th century. He created several Shinkabuki dramas (his creations were called Mishima Kabuki) and was a close friend of the star Nakamura Utaemon VI. In 1957, in his short story "Onnagata" he wrote that "an onnagata is the child born of the illicit union between dream and reality" [more details].